The L.A. alternative folk singer-songwriter shows you what it’s like to live in her skin. 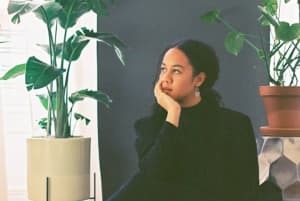 Long, drawn-out baths, therapeutic trips to the flower market, and casual strolls down dimly lit streets; these are the activities alternative folk singer-songwriter Nakaya engages in during the video for "Dear Skin," shot in her original stumping ground of Los Angeles. It's the second single off of her debut EP, Out of Breath, and finds the alternative folk singer using her sensual, streamlined voice to dedicate a poetic love letter to her threadbare skin, expressing the desire to repair it while simultaneously pleading for it’s forgiveness: Please stay with me my darling and we’ll rest like we’ve cleansed our sins, she sings. Out of Breath is out now and available to stream in full here.